Things to do and see in Key West, Florida. Visitors to this island paradise don’t need to feel that they are leaving the world behind, unless they really want to. There is plenty to see and experience in Key West and, because the island is small, nothing is very far away from where you are staying. Of course, there are beaches, most of them on the south side of the island. From the very busy Smathers Beach with its volleyball games and watersport concessions to the much quieter beach at Fort Zachary Taylor, you’ll want to sample them all. There are also several parks on the island and, again, your choice will depend on what you want to do. From the 19th century Fort Zachary Taylor park to the gardens at West Martello Towers, to the ball fields and tennis courts at Bayview Park, and all the others in between, you are sure to find something to suit your chosen activity. 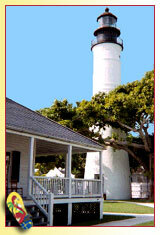 Key West has lots of history and many museums to show for it. A good place to start would be a ride on one of the tour trains or trolleys; the conductor will relate stories with local color and you will get an idea of places you will want to revisit to learn more. A cruise out to the reef from Key West Harbor will show you the island’s beauty from a different perspective and will introduce you to the beauty hidden beneath the waves. Key West’s waters also provide great diving and snorkeling experiences for the more adventurous. The less adventurous may want to hitch a ride on one of the glass bottom boats that can show you the reef without your getting wet. Kayaking and ecotours are becoming very popular for the nature lover, and some even feature dolphin encounters. The Florida Keys is a fishing Mecca and there are several private and party boats that can give you a great deep sea fishing experience. Flats Fishing is extremely popular and backcountry guides abound. For the visitor that enjoys the cultural experience, there are movie theaters as well as theaters that feature live performances. Key West has always attracted artists and its many art galleries display local talent as well as national and international artists. And, for the golf enthusiast, Key West has a public 18-hole, 200-acre golf course that wends its way through beautiful tropical scenery. Facilities include a driving range, clubhouse and restaurant, and a pro shop.